Our little schoolhouse has a bathroom. It has a door from the outside and a window and a vent to allow for air flow. It apparently also allows in bats. We had spent several hours cleaning up the bathroom to prepare for the start of school. In order to maintain it, we purchased a broom and several other cleaning supplies. On one of our first few days of school, Esther went in to use the bathroom in the morning and found a bat on the broom handle right about eye-level. 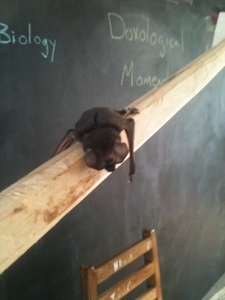 She came back into the schoolroom saying, "Dad, there's a bat in the bathroom." David went and got the bat for a teaching moment. Here it is. It is apparently one of the micro-bats that help keep the insect population down. In our neighborhood here in Jinja there are fruit bats that rest in the trees. Around dusk they all start flying around. These fruit bats are at least a foot across. So after seeing those huge bats flying around, this little micro-bat seems insignificant. Since we want the bats to live and eat all the mosquitoes, we released our new little bat friend. Today we were cleaning the schoolroom and bathroom as we wrapped up our first full week of school. Each student had different chores and Esther was cleaning the bathroom sink. She picked up a hand towel that was in the bathroom and started wiping the sink with it. Then the bat squeaked and fell out of the hand towel into the sink. I am so thankful for my brave little girl who just laughed about it and went to tell her dad that now there is a bat in the sink! Her fascination with creatures that most girls squeal about is one more way that God equipped our family for life in Africa. 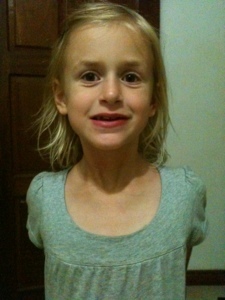 Here is my brave little bat-girl. I love this, and I love Esther. Tell her that please!!! XOXO.